Home Contact Form Google AdSense How to Return Check HOW TO: Contact Google Adsense after your check / cheque returns? 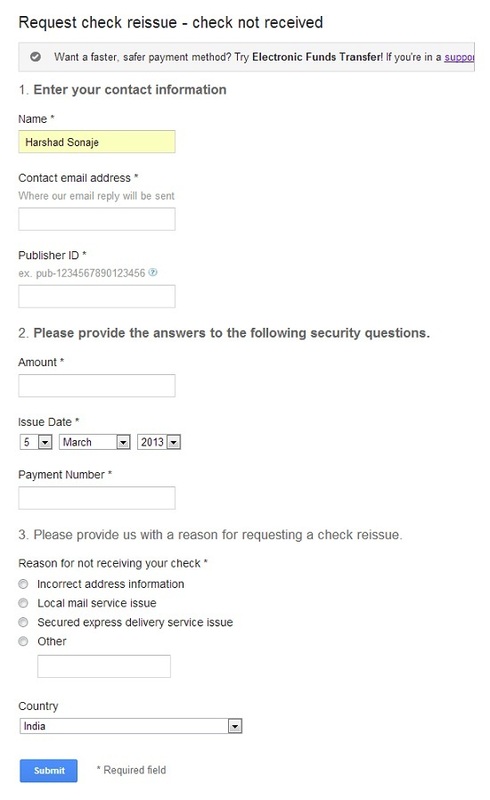 HOW TO: Contact Google Adsense after your check / cheque returns? Many adsense publishers from India struggle when their hard earned check from Google return back as they are not able to collect the check. There is no direct contact number for Indian publishers which is a shame. After my check was returned I was also very frustrated but after lot of Goggling I finally found a contact form which is specifically designated to address this issue by Google adsense. Just visit this link and you will be presented with the contact form you were looking for all these days. All the above information like Payment number, Amount and Issue date are the things you will find in your payment statement from your Adsense account Lats Issues Payments. After you submit form you will get below reply. We'll try to get back to you within 24 hours if your query is about your own account and requires an action from our side. However, depending on the volume of messages that we receive, it may take up to 48 hours or longer for us to reply. Thank you for your patience. I hope this information really helps and please pass on this information to all your blogger friends. After a week the check was stopped and reflected in the adsense account.